La Plata Valley Raceway in Farmington, New Mexico is getting ready to kick off their 2016 race season next weekend May 20-22. Click “Read More” to view their press release for this event along with the flyer that lists their complete 2016 season schedule. The 2016 Avenal Sand Drags Spring Nationals lived up to its billing as a great show from start to finish for the Central California crowd. Each race at Avenal seems to get a bigger racer turnout and this race was no exception with over 200 entries competing over the three days of competition. Race Director Chachy Zavala along with his crew did an exceptional job putting cars down the track and getting the show done in a timely manner, making it extremely enjoyable for racers & spectators alike. Before we take a look at the action, NSDN wants to give a huge thank you to all of the Avenal Sand Drags crew for the A1 top notch hospitality all weekend for us. It makes it so much easier to bring the coverage to the masses right here on National Sand Drag News. Now let’s take a look at the top performers from this event. National Sand Drag News is proud to announce that Good Vibrations Motorsports has come on board to be the Presenting sponsor of the NSDN Live Stream from the upcoming Mayhem at Soboba SCSDA event on May 20-22 as well as the SCSDA Season Finale September 30-October 2. We are proud to have such a quality organization back our coverage for these events. Please support Good Vibrations by purchasing your performance parts (check their site for their full selection of great products) through them, and be sure to thank them for their support of National Sand Drag News. A huge thank you goes out to Good Vibrations as well as these fine folks for being sponsors of our NSDN Daily Race Coverage from the May SCSDA event at the Soboba Casino in San Jacinto, CA: Hammer Down Racing (Dennis Rieck), Morris Family Racing, Rialto Trophy, MPC Racing, Kevin Williams Racing, and Flirtin’ With Disaster Racing (Kenny Hayes). The pre-registration deadline for the May SCSDA event is quickly approaching. Be sure to click the links below to take care of the pre-registration process, as well as download & print the event weekend schedule. We are looking forward to seeing everyone at this great event. NSDN would like to pass along our best wishes for a speedy recovery to Jeff Guillot. Jeff had a serious accident last weekend with his "Wild Thing" nitro burning 3-wheeler at his home track in Louisiana during the PSDA Gator Nationals. Per the latest update from the PSDA, Jeff has a long road ahead but is expected to fully recover (full update below). 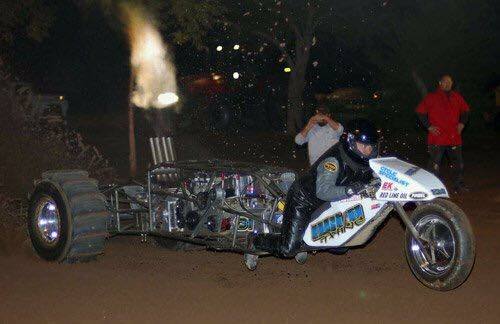 Jeff is the ATV World Record holder and many time event winner at races across the country as well as owner of the NE Louisiana Sand Drag Track & PSDA Board Member. On top of all that Jeff is a down to Earth great guy with a huge passion for sand drag racing. NSDN continues to send positive thoughts to Jeff and his family as he continues towards a full and speedy recovery.